The port town of Calvi, in the Balagne region of north-west Corsica, boasts the intrigue of traditional Corsican culture while effortlessly maintaining the comforts of a modern resort. 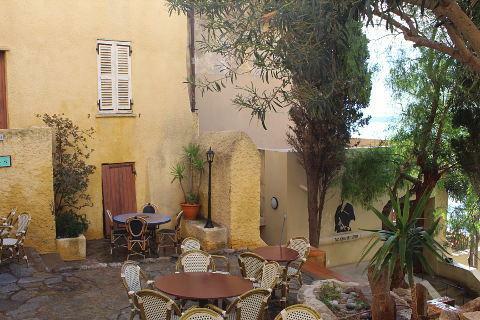 You will find picturesque views of the coast and there are many enjoyable places to spend time both in Calvi itself and the surrounding region. 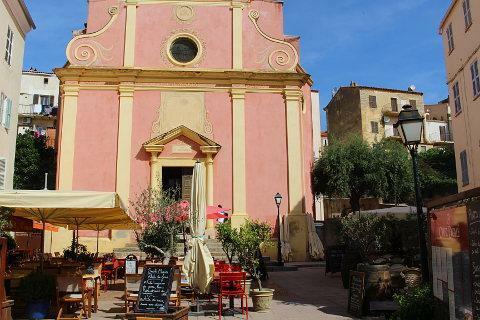 Calvi was not our favourite destination on Corsica; beaches are better at Porto Vecchio, citadels at Bonifacio and scenery at Porto, however with its combination of beaches, resort and historical centre it is a very accessible resort and can be visited without hiring a car. 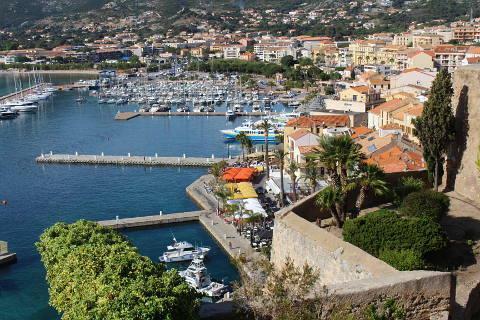 If you travel to Calvi by ferry you will immediately see the full effect of the attractive port, the towering Citadel, the rugged mountains, and the forest of pines. If you do not arrive by ferry, you can still see great views of the area from the water by taking one of the many boat trips or pleasure cruises available in the marina. 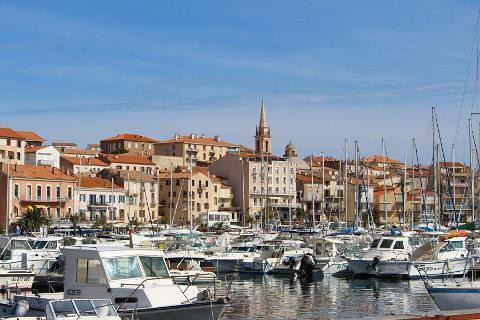 Start your visit in the Port de Plaisance, which is a friendly marina and an enjoyable place to view the many luxury boats and bright fishing boats as they arrive and depart. 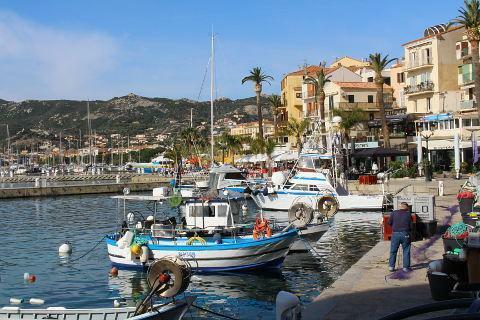 Calvi is also one of the stops made by the large cruise ships to Corsica and these can often be seen in the harbour. In Calvi most social activity takes place at Quai Landry. This is a beachside walkway which connects the port to the marina, and offers restaurants, bars, cafés, side shops, and hotels. There are not many historical points of interest for sightseeing in this area, but it is an excellent place to shop or grab a bite to eat and enjoy the relaxed atmosphere. 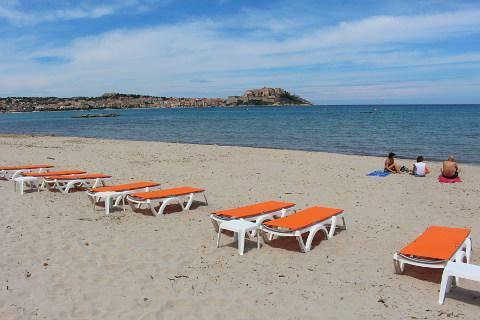 For many visitors it is Calvi’s beach that is the big attraction and centre of a visit. The beach is a long, narrow strip of white sand and serene, shallow water that stretches nearly 6 km (4 mi) along the length of the bay. It is not the most attractive beach on Corsica by a long stretch but it is functional and easily accessible. The beach also has lifeguards and very good facilities, such as picnic areas and snack bars. Popular activities include windsurfing, waterskiing, jet skiing and paragliding. For those who prefer a quieter place to soak in the sun, a less populated and wider strip of beach can be found at plage de l’Alga, near Revellata point. A little further round the coast near Lumio the beaches of Arinella and Algaio are the best in this area. The mixture of sandy beach and large flat rocks is an attractive combination and you can see Calvi on the other side of the bay. The Genoese Citadel is the main part of the town, and its most important historical monument. It was a military outpost in the 15th century that helped guard the city against international attacks. The citadel sits high above Calvi port from where it towers over the sea. From up here you get some great views of the coast and harbour. Within the citadel old town there are many tunnels and long winding stairways as well as plenty of narrow walkways tucked between quaint old houses. Places of interest in the Citadel include the restored palace of the Genovese governor, and the remains of a house that is rumoured to be the place where Christopher Columbus was born*. The original house was destroyed by Nelson’s troops in 1794 and today a statue stands on the site, commemorating the 500th anniversary of Columbus’ birthday. In the Citadel is the Cathédrale St-Jean-Baptiste, which was erected to hold an allegedly supernatural crucifix called Christ des Miracles. Look out also for the pretty pink baroque church of Sainte-Marie. Wandering around the cobblestone streets and shops in the Citadel is a lovely way to spend an afternoon or quiet evening. Additionally, a jazz festival is held in this area every June. The Museum of Corsican Ethnography is also located in the Citadel and holds many items in connection with the history and culture of this beautiful island. This is a recommended tourist destination, along with the military museum. One enjoyable walk from Calvi is up the hill to the church of Madonna della Serra, for more splendid views. There are boat trips to the beautiful Scandola Natural Reserve from Calvi. 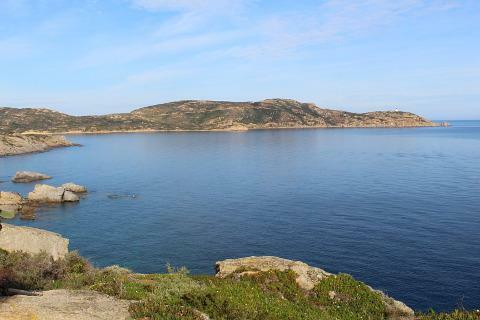 A popular excursion is to take the coast road north to the 'almost island' of l'ile Rousse passing by Lumio and Algajola. There are a few mountain villages nearby. Most are unremarkable but as a group they make a pleasant day out. These include Corbara, Pigna, Aregno, Montemaggiore and Calenzana. Sant Antonino is a most beautiful village and is very pretty. Be sure to include this in your visit.